The subject of STEM is big news these days, with increasing understanding about how critical an adequate education in science, technology, engineering and math really is, and why children need to be on board long before they reach college years. At present, the resources are simply not available in schools to teach kids all they need to know about STEM. However, after-school and summer programs specializing in STEM could be the ticket to raising your child’s awareness, fostering an interest, and getting them participating in STEM, and with spectacular results. Why is there a need for STEM outside of school? Although the majority of our children’s teachers are diligent and committed to educating their students, they often simply do not have the resources, or expertise, to teach STEM at the required level during middle and high school. In addition to this, aside from math, emphasis is most definitely put on other subjects, leaving a gaping deficit in STEM topics. For STEM education to be successful, it needs to incorporate fun, be interactive, and allow kids to tackle problem solving, rather than consist of stiff, formal work straight out of a text book. The majority of schools are often ill-equipped for teaching STEM, and are most certainly limited by time constraints. This means that there simply isn’t an adequate provision for encouraging and developing the analytical and problem-solving skills that come with STEM. The increasing awareness of the importance of STEM means that there are now untold organizations offering after-school and summer programs. When seeking the right program for your child, it is important to ensure that it is age appropriate; if it is too basic or advanced, you run the risk of them losing interest. Make sure the program is interactive and encourages thinking and creativity and where the teachers have real-life STEM experience. Two well-established national organizations are 4-H, where kids learn about aerospace, engineering and robotics, and Girlstart, which uses positive female role models who help empower girls to learn about, and feel confident in, science, technology, engineering and math. The Afterschool Alliance and the National Afterschool Association (NAA) are two leading authorities on STEM programs outside of normal school hours, offering valuable resources and information regarding extra-curricular learning opportunities. Why are STEM after-school programs so successful? There have been many studies that are able to track the progress of students who participate in after-school STEM learning. One interesting report published by the Afterschool Alliance details how markedly the students’ perception is positively altered with regards to how STEM relates to society, and to them. Students involved in STEM after-school have an increased capacity to understand STEM activities, with a distinct rise in curiosity, ability, and awareness. Additionally, students who take part in STEM after-school activities reach higher levels of education, and are more likely to have a career within the field. The programs especially succeed in improving access to STEM for those that are currently under-represented in the sector, such as girls, and also minority groups, including as Hispanic and African American. In addition to after-school programs, many organizations run summer camps specializing in STEM subjects, where kids have an intensive experience, often in a personalized setting, where they can hang out with like-minded individuals. As with after-school programs, there is a great deal of choice, so it is always a good idea to check out their expertise and reputation before enrolling. One organization, iD Tech, offers teens the opportunity to learn about a wide range of relevant topics, including film-making, programing, robotic design, and app development. NASA’s Summer of Innovation program has been set up to respond to the need for adequate STEM learning, paying particular attention to encouraging under-represented groups. 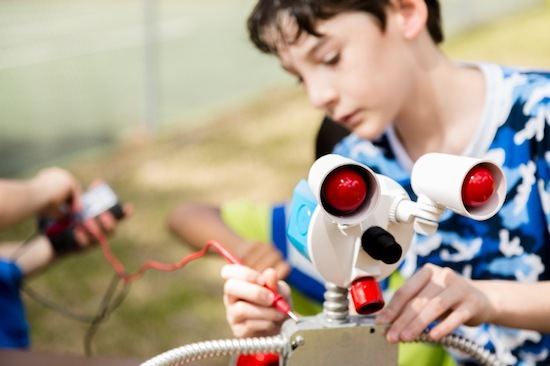 Featuring exciting themed camps, which include Aeronautics, Mars Exploration and Life Science Camp, this is the perfect environment for students to immerse themselves in hands-on, problem-based activities. Most parents are already aware of how important STEM is during their child’s school years and beyond; many will also be conscious that their school is lagging way behind with teaching STEM subjects. Therefore, it makes logical sense to seek extra-curricular ways to enhance a teen’s STEM learning.